» Forum » Electro-Mechanical » EM Pinball Tech » Mysterious Bally Galahad schematic. » Mysterious Bally Galahad schematic. By the way, this might also apply to the Bally Camelot as well. 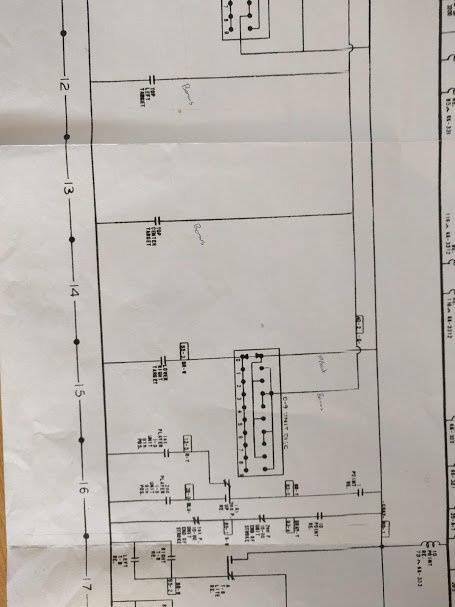 I've been breaking my head over a small part of this pinball's schematic, so maybe some one can set me straight. In the top left-hand corner of the playfield, there is an Extra Ball Alley. It contains a Normal Open roll over button (EXTRA BALL ALLEY ROLL OVER) and there is a Normal Closed switch in the one-way rebound gate (EXTRA BALL ALLEY REBOUND GATE). These switches are wired in series, see schematic detail. When you send the ball through this alley it hits the roll over, which closes the circuit. By the time the ball has passed the roll over, it may pass through the rebound gate and find its way to the top of the playing field, but by then the Roll Over will already have opened again - so it makes absolutely no sense to have a N.C. switch in the gate to open and break the circuit. The ball cannot be physically opening the rebound gate and closing the roll over at the same time. Why is there a N.C. switch in that rebound gate? "The schematics and the playfield are probably copyright by Bally." Used here for learning purposes only. Good question. Maybe a guard against the gate being stuck open? That would work, but it seems like a bit of overkill to me. Do they want you to hit the rollover without passing it, so that the ball returns down that lane? If you sent it to hard to hit the gate and don’t get the reward. Kinda like the skill shot on gottlieb D&D. The ball has to hit the gate and return down the ramp. It the ball breaches the gate and continues along the ramp there is no points. Information is limited as there is no schematic or instruction manual at IPDB. There is a manual for Camelot but no schematic. From that we can see that the extra ball opportunity is "randomly" controlled by the 0-9 unit disc which you can see in this piece of the schematic. It looks to me like the extra ball chance will be lit if that disc hits the 0 position as it is drawn in the schematic. As shown by the short 2-arrowed line in the middle this will connect extra ball relay through to the extra ball alley rollover and the extra ball alley rebound gate. In this position, the instant the extra ball alley rollover is closed by the ball rolling over it the extra ball relay will be energized and it will stay energized via its own lock in switch which is connected to score motor switch 10. The extra ball relay won't be released until the score motor turns and that switch opens. Not being able to see the rest of the schematic, I would presume the score motor is triggered elsewhere to turn so it can give the 300 points instead of 100 you usually get for going up the alley. After that happens, the extra ball relay will then be deenergized as the score motor makes it to the 10 position. I agree that the rebound switch seems to have no useful function in this circuit. However, maybe it does have a function for something completely unrelated. When that 0-9 unit disc is in any position other than 0 it looks like there will be a connection on upwards and to the right to some other mystery thing which we can't see here. Maybe there is something over there that needs that gate switch opening to make something happen. 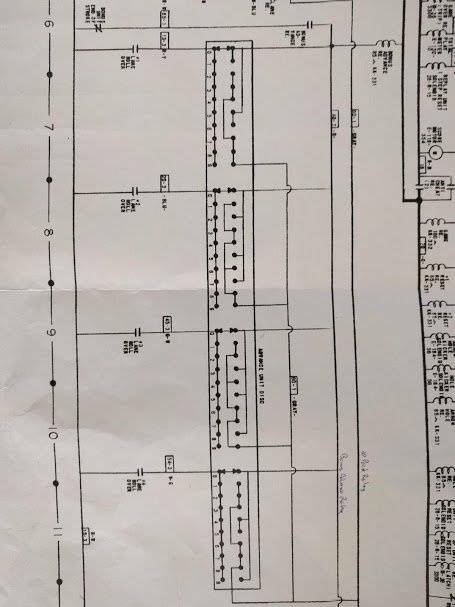 Can you show some more of that area of the schematic? Any logic would rely on the real time speed of the state of both switches. How long from a switch closure until the relay energizes and closes the self-hold switch? OP, does a hard shot over the switch and through the gate award the extra ball? Nope, once you hit the rollover you're set. Yep! I tried shooting, pushing it by hand... I cannot get it go fast enough NOT to award the rollover. However, maybe it does have a function for something completely unrelated. When that 0-9 unit disc is in any position other than 0 it looks like there will be a connection on upwards and to the right to some other mystery thing which we can't see here. Maybe there is something over there that needs that gate switch opening to make something happen. 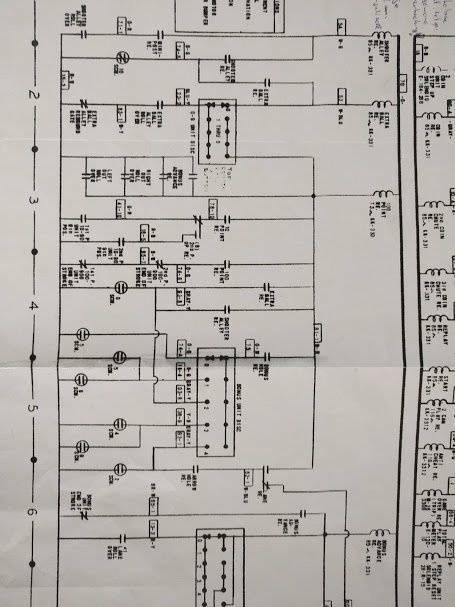 Can you show some more of that area of the schematic? Your analysis is spot on. I will dug up the schematic again (it is in the workshop). Thanks for your time! If this feature is awarding an "Extra Ball" where is that state stored until the extra "Shoot Again" ball is played? With the AAB Relay Kit on my Rocket III the AAB Relay holds until the added "Shoot Again" ball is played then it releases. But the above suggests that the "Extra Ball" relay closes when the score motor runs so there must be more at play here. The NC switch in the gate is there in case the gate is stuck open the rollover switch is disabled. I've had a Galahad that's what that circuit is for. Firts of all: sorry for the delay. I took some pictures of the schematic to the right of the indicated point. As far as I can see it connects up to the 10 Points relay, see images attached. From the looks of it, I tend to agree that the switch is there just to disable the rollover switch in case the gate is stuck open, as mentioned by mrbally. Thanks all for the insight. Let's keep learning. What keeps the extra ball relay pulled in once the score motor turns and releases its hold circuit? The Extra Ball Relay triggers the Shoot Again Relay which holds itself until the ball ends up in the ball trough and gets re-entered into the game. The ball passes the #2 Ball Trough switch which releases the Shoot Again Relay.